As schools start across Kentucky, educators and teachers around the state are planning programs and initiatives designed to help meet the Department of Education’s Arts and Humanities Program Review. Implemented last year, the Arts and Humanities Program Review is a method for schools to analyze their arts programs, initiatives and instruction. In June 2013, the first year of self-reporting, just one district out of 174 achieved the distinguished level. In comparison, 41 districts ranked proficient and 132 districts fell into the needs improvement category. To help schools looking for ways to improve their self-assessment scores, the Kentucky Arts Council offers several arts education programs. 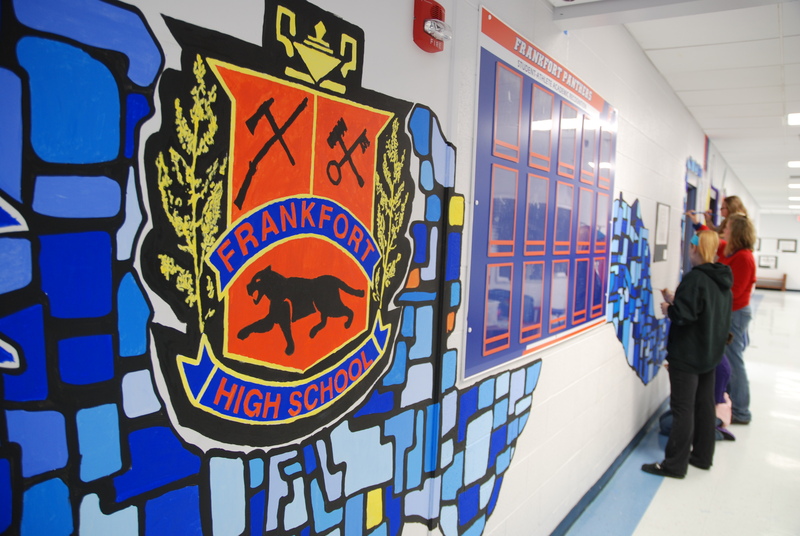 Students at Frankfort High worked with artist Alfredo Escobar to design and paint this mural as part of the Teaching Arts Together program. Specialists with Arts Tactics (SWAT): The SWAT program is a resource that connects Kentucky schools to arts education professionals that provide three-to six-hour consultancies geared towards developing plans and assessment tools for integrating the arts across the curriculum. These consultancies lay the groundwork for stronger arts initiatives in the district, and can help educators plan how best to incorporate the arts as they strive to meet program requirements. The next application window for SWAT consultancies is Oct. 15 – Dec. 1, 2014, for consultancies that will occur Jan.1- June 30, 2015. Teaching Arts Together: The Teaching Arts Together program brings professional teaching artists into the classroom to collaborate with educators on the design and implementation of innovative one- to four-week residencies. The arts residencies give students and teachers the opportunity to participate in the creative process and to learn from an artist who has mastered the skill or art form. Past projects have included designing and painting a mural featuring the school’s traditions, creating a short clay animation film and painting wooden quilt blocks for a collective courtyard decoration. The next deadline to apply is Oct. 1. TranspArtation Grant: One of the most popular arts education initiatives, the TranspArtation grant offers transportation funding for schools to attend arts events and performances at one of the many approved Kentucky Arts Partnership organizations. The grant is awarded based on the number of students being taken to the event, and the distance in mileage from the school to the performance venue. Through this funding, schools are able to take more arts-related field trips and work towards incorporating more arts programming into their every day schedules. Applications are accepted at different times throughout the year. The next deadline is Nov. 1. For more information about these programs or for other arts education opportunities, contact Jean St. John, arts education director, at 502-564-8110, ext. 486, or via email at jean.stjohn@ky.gov. All great programs! I love how these let participants collaborate with practicing and professional artists to hone their skills!